SAFETY FIRST: Trant Engineering’s health and safety team outside the multi-disciplinary contractor’s head office at Rushington, near Southampton. 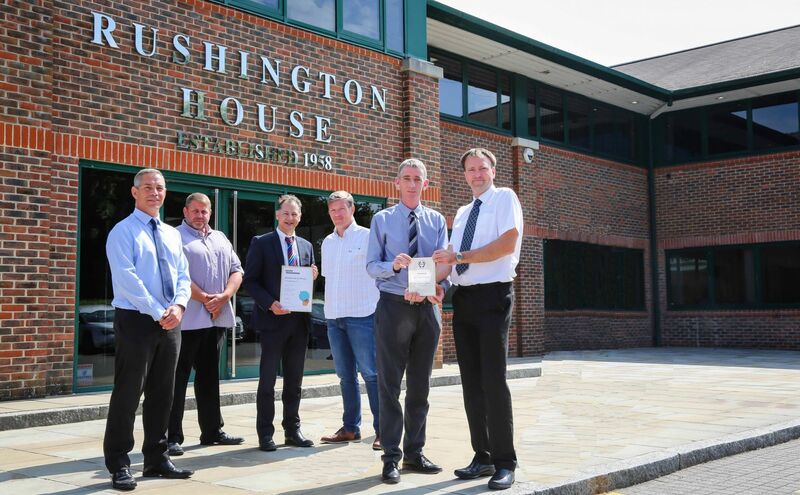 Pictured from left with the award certifications from the Royal Society for the Prevention of Accidents (RoSPA) are Peter Welch, Steven Yendall, Mark Patterson, Flory Truelson, Brendan Dowd, William Millett and Daren Nobbs. Trant Engineering, in its 60th year, has been awarded its 30th consecutive award by RoSPA. A multi-disciplinary contractor working in challenging environments across the UK and internationally has been presented with its 30th consecutive national safety award. Southampton-based Trant Engineering was commended in the annual occupational health and safety awards held by the Royal Society for the Prevention of Accidents (RoSPA). The firm employs more than 1,000 people who work at up to 30 operational sites at any one time in the UK, Falkland Islands, Ascension Island and Channel Islands. Clients include ExxonMobil, the Ministry of Defence, National Grid, United Utilities, Wessex Water and Magnox, which works for the Nuclear Decommissioning Authority. Trant Engineering - in its 60th year - achieved plaudits in the category for the construction engineering industry sector. The highly-regarded awards are presented to companies and organisations which demonstrate outstanding commitment to accident and ill-health prevention. As part of Trant Engineering’s exhaustive submission, up to 80 pieces of evidence had to be shown, with 600-word answers for each of the 12 detailed questions. William Millett, Health and Safety Manager at Trant Engineering, said: "This is the 30th consecutive year that Trant Engineering has been recognised by RoSPA for our continual commitment to the health, safety and well-being of staff. “Colleagues work on complex infrastructure projects for some of the largest names in industry in energy, nuclear, oil and gas and process and water. Brendan Dowd, Business Development Director at Trant Engineering, said: “Trant Engineering has been pioneering health and safety excellence in challenging, high-risk environments for decades now, long before safety was a priority in the UK construction industry. Trant Engineering has also twice been named the best in Great Britain for looking after the safety of its staff; the Sir George Earle Trophy is RoSPA’s top accolade. The Sir George Earle Trophy was presented to the National Physical Laboratory in Teddington, south-west London. Her Majesty The Queen sent her congratulations to all the award winners in a message within the awards event brochure. Gerry Somers, Managing Director, UK, Trant Engineering, attended the 2018 RoSPA Health and Safety awards ceremony at the Hilton Birmingham Metropole Hotel, with colleagues from the company’s health and safety team. PROUD: William Millett, left, Health and Safety Manager at Trant Engineering, and Gerry Somers, Trant Enginnering Managing Director UK, receive the RoSPA commendation – the 30th consecutive year the company has won an award. Guest speaker was stand-up comedian Ed Byrne from Mock the Week, The Graham Norton Show, Have I Got News for You and Live at the Apollo. The majority of awards are non-competitive and mark achievement at merit, bronze, silver and gold levels. Gold medals, president’s awards, orders of distinction and the Patron’s Award are presented to organisations sustaining the high standards of the gold level over consecutive years.